Forums General Discussions Rusty Keeney, R. I. P.
Rusty Keeney, R. I. P.
A suggestion: Let's all chip in and pay for a site where Rusty would have been, right in the middle of where we're going to be at Rusty's Memorial GTG. We'll leave it empty for the "missing man" and his pooches. We can make it our (Keeney space) center of operations and do our toasts there, perhaps a nice campfire once or twice, an auction, etc..
Lou, a great idea. I'm in. Great idea Lou. We're in. where we could write in our Barth names. Thinking of something that looks like a yard sign politicians use (but less political, of course!). And it should be smaller so we can mail them out ahead of time. These signs would then become keepsakes for us to take home. Perhaps you could design something and get a total price to include mailing so we can order them from you. Send me the signs and some bucks to cover the mailing and I'll be glad to do the work of sending them out. I've PM'd Richard Muise to contact the fairgrounds with Rusty's last campsite at Elkhart so he can reserve it. Hope we can get the same area and get Rusty's site situated somewhere near the middle of all the commotion. Three Full 50 Amp RV Hookups ! 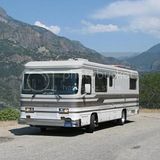 1994 Sovereign 36' Widebody on Spartan IC (Mountain Master Lite) Chassis. Just received this email from Diane, Rusty's sister. Rusty's father, also a career sailor is also buried there. Please feel free to share this information. I know Rusty has some fellow Barth folks that wanted to know. Thank you all for your sympathies and condolences. Quick Reply Shortcut: Rusty Keeney, R. I. P.